I learned my lesson the hard way last year and only opted for only one game at Wrigley Field this season. The way they’re playing, this was a good call. While it’s always nice to sit in the seats at Wrigley Field on a summer afternoon or evening, it becomes more than a little disheartening (not to mention expensive) to do s0 when your team is beaten (or as is often the case, beat themselves) time and again. You can only drown your sorrows with so much overpriced beer and mediocre hotdogs. Last spring, when Cubs tickets went on sale, my friends and I decided to pass. Wednesday’s game was a freebie; it’s my good fortune to have friends with friends who have great seats at the ballpark. After all the heat we’ve had, the evening of our game was cool (in the 70s) and extremely pleasant. We were there on a good night–Ron Santo Night (his statue out front was unveiled before the game–I’ve never seen so many people aiming their cellphone cameras at the same thing) and the Cubs actually won. It was the least they could do in honor of Ronny. Last night, as the Cubs were defeating themselves against the Astros, I was entertained by watching the ballpark announcer doing his job. Our seats were in the upper deck, to the left of the boxes where the press, TV commentators, and radio commentators (Hi Pat and Ron!) sit. It's also, as I learned last night, where the park announcer sits, right there in the window on the end. I assume the organist is up there somewhere as well. Of course, after years of hearing this guy's voice, he didn't look anything like I imagined. It was somewhat entertaining to hear Wrigley's voice of god and be able to turn my head and watch this guy wearing a suit simply reading off a sheet of paper into a big mic. Watching the Cubs lose. Again. Last year about this time, my friend Karen introduced a new routine in her life. She wanted to do something each day that would be personally rewarding and made a pact with herself to take a daily walk to the lake. In addition to being a healthy thing to do, she found it rejuvenating and a revelation to see how beautiful and ever-changing the lake was on a daily basis. It also sparked a photo project that involved shooting the same tree from the same angle every time she passed by. It’s a gorgeous record of the changing seasons and the thousand faces of the lake. A few weeks ago, she suggested that I take up such a challenge, to find something I could do every day that would be rewarding and fun. I thought about what new routine I could do that would add a positive spark to the day and just might, surprisingly, lead to something. I hit on this, taking a photo of my feet, wherever they might take me, every day. An extreme variation on my Saturday 3 p.m. photo. Also, an interesting way to journal my days. We’ll see where it goes. 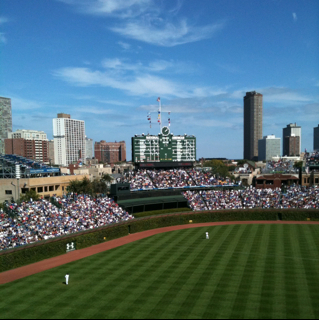 Today’s photo was taken at the Wrigley Field, during my final game of the 2010 season. There were lots of empty seats in the park and it was easy to get comfortable while watching the Cubs lose 4-0. Fall is definitely in the air. The night was chilly and the home team didn’t give us much to jump up and down and cheer about to keep warm. Sunday's early morning sail on Lake Michigan was picture perfect, if not a tad bit chilly. The wind was coming out of the south-west, so we were able to make a beeline down the lakeshore to the lighthouse off Navy Pier and back. I shot this with my iPhone using an HDR app. A bobbing sailboat isn't the ideal setting for trying to take two shots to meld together, so it's a bit in soft focus, but I still like the look. It captures the moment and the morning well. Trump Tower is smack in the middle of the cityscape, with the Sears Tower (yeah, yeah, Willis, Tower whatever) just to the left and the Hancock Tower standing supreme on the right-hand side. The white bubble off on the far left is the anchored helium balloon on Navy Pier. Yesterday afternoon, our seats for the Cubs game were outstanding. Unfortunately, the game wasn't. Things turned dark pretty early on. Dempster's pitching was weak and he was taken out early. From then on, things continued down hill for the home team. What else is new. Crying in my beer, surrounded by empty seats. From our seats, we had a great view of Mets players as they jogged, walked, and hopped across home plate. By the ninth inning, when it was beyond pathetic, we'd switched tactics and were rooting for the Mets to score an even 20 runs against the Cubs. In the end, they came up 2 short, beating the Cubs 18-5. I've got one final ticket to the ballgame this week. 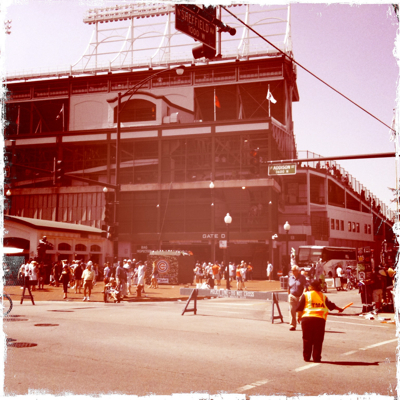 I'm hoping for a better outcome to wrap up my Wrigley Field outings for 2010. Happy Labor Day Weekend All! I'm very delinquent on the old blog here and have much to post but lately I've just not had the time, energy and/or inclination to do so. I've been busy with this, that and the other thing, including a freelance gig bug-testing a website, so blogging has been slight. Apologies. I'm sure when the weather turns cold, I'll be back at it in force. I have many book reviews to catch up on and I don't want to leave them until the end of the year, traditionally my time to play catch up before I compile my annual reading list. Also, I'm looking forward to starting a new daily project that I'll unveil on the blog next week. Nothing major, just a little creative spark to get me blogging more regularly and have some fun. Here’s a little wrap-up on my whirlwind day yesterday. If you follow me on Twitter, I apologize in advance because this will be old news for you. I’ll include some of my Tweets and elaborate beyond the 140 characters. Started the day with a visit to the acupuncturist. She worked on my upper back and pectoral muscles which haven’t gotten a whole lot of use since the surgery. She loosened me up, working out some of the tightness. I’m going to start a little yoga on my own to stretch, strengthen and increase my range of motion. I’ll start easy with some sun salutes. After a general, restorative acupuncture treatment, Karen and I stopped at the Julius Meinl in Lincoln Square for coffee and an early lunch. (I had the melange: frothy milk, espresso and a dusting of dark chocolate. Delicious.) And, because it was Bacon Thursday, I had to try the bacon sweet roll, which had a generous slice of bacon baked right into the cinnamonny dough, with a light creme cheese frosting on top. I also had the red pepper, bacon and blue cheese quiche. Amazing. The blue cheese really made it. 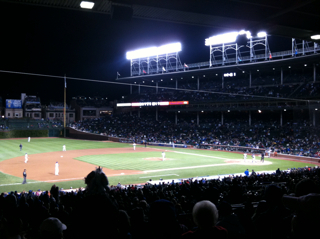 Then, it was over to Wrigley Field for my first Cubs game of the season. The day was sunny and warm with little humidity and a breeze in the stands to keep it cool. Absolutely perfect weather to sit and enjoy a game. I didn’t mind the new controversial Toyota sign over the left field bleachers. The “see-through” design is much preferable to a standard billboard and frankly, I prefer it over the ugly Horse Shoe Casino ad on the roof behind it. (Though I don’t like the beer, I liked the bright Budweiser roof that had graced that house for years.) I do hope this is it for signage in left field but I’m not holding my breath for the next changes to hit Wrigley, whatever they may be. Time will tell as to whether the Ricketts family is starting down a slippery slope. The other big change (besides the spiffy upgraded restrooms–with their strangely low toilets) was the addition of prerecorded “walk on” music for each of the Cubs. (Gone is the organ music that accompanied players as they walk up to take their turn at bat.) Now, like other big league parks, Wrigley has begun playing snippets of prerecorded music. Half the time we couldn’t really make out what the song was and they didn’t blare it nearly as loudly as at other parks. Whether the music was helping to fire-up the players seemed doubtful, since the Cubs continued with lackluster hitting. That was, until the ninth inning when the bats got hot and they beat Oakland in walk off, 3-2. So far, one change the Ricketts haven’t made is the one I’d be 100% behind: changing the stupid song that’s sung after every home game win. “…the Cubs are gonna win today…” No, idiot, the Cubs WON today. Ugh. We had a few hours to kill before our 7 o’clock sail date at Montrose Harbor, so Karen, Anne and I headed over to Hopleaf for a craft brew and dinner. I tried a saisonniere, this one by Urthel. It was very tasty, the perfect crisp beer for a summer day. Had the Tilapia sandwich with, of course, some of their delicious pomme frittes. The beer paired nicely with the food. Then, down to Montrose Harbor. It was a beautiful evening. Calm winds, clear skies, with a few clouds that promised a great sunset. Got on board, prepped the boat, headed out and as soon as we cleared the harbor entrance, we entered a non-stop washing machine, bobbing this way and that way, up, down, back and forth. The lake, coming from different directions and bouncing off the shore and the breakwater was just a sloppy mess. This combined with a minor sail problem that we were unable to fix on such bouncy seas. We tried to sail with the jib only, but there wasn’t enough wind, and by then, a mere 30 minutes on the water, I was starting to feel a little green. I wasn’t the only one and so we headed in to get out of the mix and fix the sail. After we’d buttoned up the boat and were sitting on deck enjoying the evening and watching the sun set, the Captain recommended a little whiskey on ice to settle our stomachs. Have to say it worked and we ended the day on a sweet note. We new it was a risk when we bought Cubs’ tickets back in May for games in late August and September. At least, I said to myself, even if they’re out of contention (which they very much are right now) it’s pleasant to be outside enjoying a game on a lovely summer night at Wrigley Field. That was before the Ice Age summer struck. This evening it was long sleeves and layers as I watched a losing game in 50-degree temps. I expect that in April, not August. Got a good news/bad news scenario from the vet today. The good news: my cat Maisy’s thyroid condition is treatable with a one-time treatment, which has a high rate of success. The bad news: $$$. Kirsty, frequent commenter to this blog, will be in Trafalgar square in a few hours to cheer her husband on as he takes to the 4th Plinth. You can catch his hour on the plinth live (3-4p.m. London time, 9a.m. central time) or catch it in rerun at the One & Other site. Break a leg Mark!